I grew up in South Africa, in a traditional Jewish house, where the rhythm of the week was punctuated by the Friday night Shabbat meal. Central to the Shabbat meal is the enriched bread known as challah. When I was young, my mum would bake the challah or kitke as we called it, and the house would be filled with the yeasty, rich notes of bread enriched with eggs, sugar and oil. She would bake loaves plaited from 3 strands of dough, said to represent peace, truth and justice although some bakers bake two loaves of 6 strand plaits which represent the 12 tribes of Israel. For festivals like Rosh Hashanah, the Jewish new year, mum would form the challah as a spiral round loaf, symbolizing the cycle of the year. Often, she would use extra dough to make bulkalach, a sweet bun, dotted with fruit and spiced with cinnamon. On Purim, the same dough was used to make sweet pies known and hamantaschen. When I was in my teens, mum started working and home baked challah became an occasional treat rather than a weekly ritual. My maternal grandparents would now bring us commercially made challah baked at Kaufies, a kosher bakery in one of Johannesburg’s Jewish neighbourhoods. This bakery was opposite our synagogue and up the road from my school. Its steamy windows, enticing smells and overfilled bagels were a constant torment for my hungry teenage years. When my family moved to London in the early 90’s we discovered Jewish bakeries in north London including the indomitable Carmelli bakery in Golders Green and Roni’s in West Hampstead. As a stranger in a strange land, these bakeries felt immediately familiar, the smells, the bustle, the less than gracious service and of course the bread, all made me feel more at home. While there are many references to a Sabbath bread in the Torah and theological commentaries, the iconic woven bread we now call challah can be traced to central Europe in the middle ages, where barches, a decorative German plaited bread, was adopted by local Jews. The practice of making plaited challah became engrained in European Jewish culture and spread around the world with the of European Jews from the mid 19thcentury. 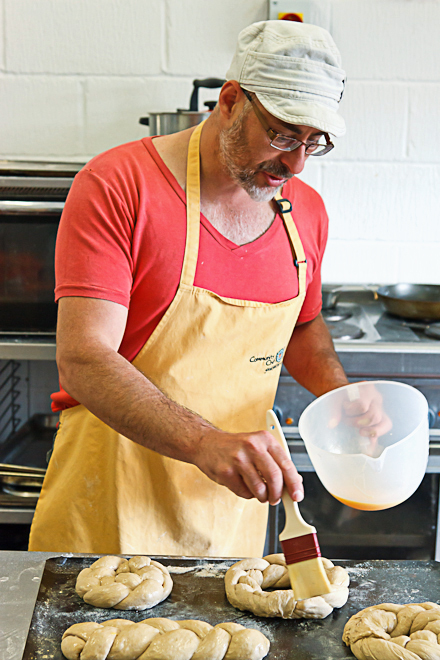 Emigrants took their baking culture with them and one sees the creation of very similar Jewish bakeries across the new world from New York to Johannesburg. Challah is made without dairy products, with eggs and oil being the main enrichments. In kosher law, one does not mix milk and meat and thus challah is baked dairy free or “parve”so that it can be served with any meal. Depending on who you ask, the word challah derives either from the term donating a portion of bread paid as a tithe to the priests or from the word for a cake. 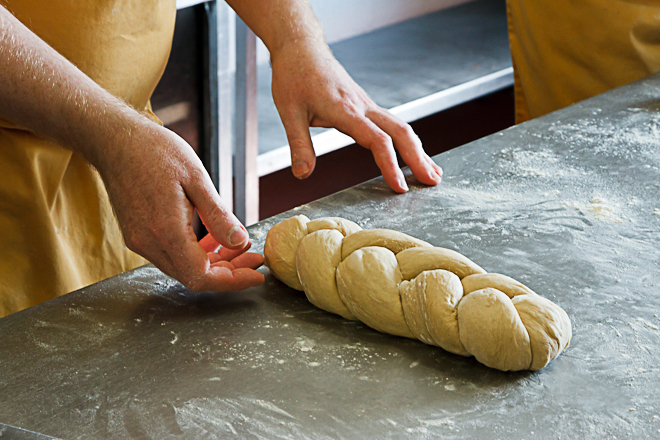 Many bakers and observant Jews still make god an offering of a portion of dough, which is ritually burnt, before baking the challah. Traditionally, pre-mid 19th century, challah would have been made with a coarser flour, sweetened with honey and leavened with natural sourdough starter. These days, most commercially produced challah is made with refined wheat, sweetened with sugar and leavened with baker’s yeast. I spoke to several bakers about their approach to challah, both technical and what it means to them. American born baker Liz Weisberg from the Lighthouse bakery, ironically, only bakes around 10 challahs per week as there are very few Jews in the wilds of rural East Sussex. She makes a straight yeasted dough at a low hydration, with a long bulk ferment. She favours a 4-strand plait which is made on a Thursday night, retarded until Friday morning when it is egg washed and baked. Liz says that she learnt to bake challah as a child at Hebrew school and that baking challah makes her feel part of a historical continuum which reinforces her Jewish roots and culture. Tami Isaacs Pearce from Karma bread, although relatively new to baking, is now known as the Challah Queen by her customers. For her, baking started as a therapeutic endeavour and evolved into a business. Tami prides herself on her decorative and elaborate plaiting, creating complex and aesthetically beautiful challah. She is part of a growing number of modern Jewish bakeries which are not kosher but do aim to make traditionally inspired hand-crafted products. In a similar vein, I spoke to Michelle Eshkeri from Margot Bakery in East Finchley. Her challah is sourdough and organic. For her, baking challah is a labour of love. Many of her customers have been converted to her style of challah and appreciate the more complex flavour and the keeping quality of sourdough. She also loves how it makes for a particular Friday vibe. The large commercial kosher bakery in London I spoke to was less than forthcoming about their baking process. All they would tell me is that they were certified by the Beth Din, one of several organisations responsible for issuing a kosher certification to food businesses, whose remit is to ensure that the challah is produced in accordance with kosher guidelines, including the ritual blessing of the bread. Having worked with food and communities for nearly two decades, I’m acutely aware of the role bread plays as a centrepiece of the multifaceted cultural smorgasbord of our postmodern existence. The bread of my youth is the bread of my family and my tribe. It is the cultural signifier that connects me to a legacy of tradition that goes back thousands of years. A legacy that weaves together the cultural and historical strands shared by our diasporic communities. Having said that, it’s an easy bread to make and utterly delicious regardless of one’s cultural or religious background.